Helping parents navigate their K-12 public school choices in Los Angeles, including neighborhood schools, magnets, charters, dual language programs, gifted options, permitting and more. 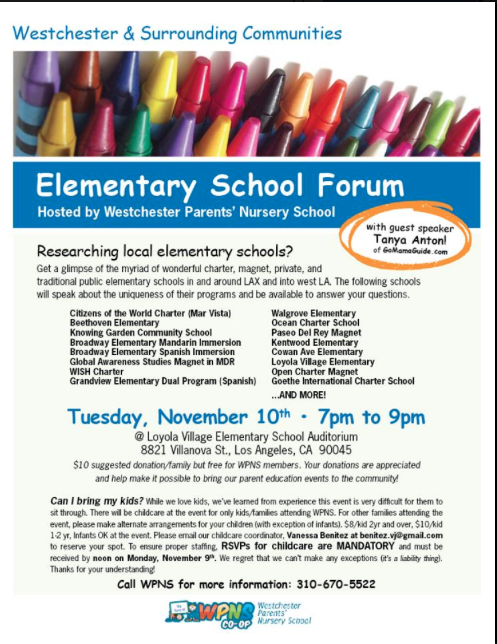 I’ll be giving the opening talk at this year’s Westside Elementary School Forum, hosted by Westchester Parents Nursery School and held at Loyola Village Elementary School. Over 30 area schools will be represented including neighborhood schools, magnets, charters, parochial, even privates! UPDATED: In addition Wiseburn Unified will also be coming to talk about their schools (Anza, Cabrillo, Da Vinci, and more), St Anthony, Westchester Lutheran, Venice Lutheran, St Mark’s and for the first time, private Los Angeles Area Independent Schools (laais.org) be represented well! It’s going to be big! $10 suggested donation/free for WPNS members. This entry was posted in Announcements and tagged area public-private schools, elementary school fair, Elementary School Forum, Kindergarten, school reps, Westchester, Westside elementary schools, WPNS by gomama. Bookmark the permalink.